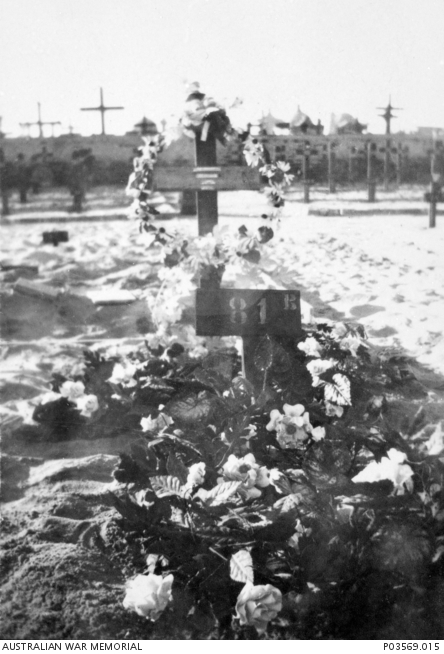 The original grave marker number 81B, covered in flowers of 3661 Trooper (Tpr) John Allen Cooper, 4th Australian Light Horse Machine Gun Squadron, of Leichhardt, NSW. Tpr Cooper enlisted on 8 May 1917 and embarked from Sydney aboard SS Port Darwin on 30 April 1918 as a reinforcement for the Imperial Camel Corps. He died of diphtheria and heart failure in Egypt on 22 October 1918 aged 22 years.